Probably many of you have heard of the OPPO brand, but if you think it’s the usual Chinese manufacturer that only makes low-end smartphones, you’re wrong. The company, which is part of the BBK group that also includes Vivo (a brand you probably don’t know) and OnePlus, unveiled its new OPPO R15 in Standard and Pro versions (Dream Mirror Edition) to the world a few weeks ago. We flew to Shenzhen to try it out and share what we saw! The OPPO R15 has a striking design. And not just because of what you’ll find on the front, which I’ll discuss shortly, but also its beautiful form. The smartphone is composed of an aluminum frame with a glass back and it feels absolutely great in your hand, despite the fact that it’s not the most compact device. The light effects created by the unique craftsmanship on the rear are special and give the R15 a nice touch of originality. The R15 and R15 Pro design (known as Dream Mirror Edition on Chinese soil) are differentiated by the rear frame, which is flat on the standard edition and slightly curved on the sides in the Pro edition. As a result, the aluminum frame is also slightly thinner in the Pro version, which allows for the curve on the rear. The fingerprint reader is in the center of body, and OPPO has decided to keep it on the back of the smartphone. There is no reader integrated into the display like on the Vivo X21, another smartphone that the sister company presented at the same time. The R15 Pro is also available in a special edition with ceramic back, although I personally prefer the look of the normal version and its reflections. The ceramic back does, however, feel much nicer than the glass, although it doesn’t render the same kind of reflective color. Why do smartphone colors lack originality? You read that right. The Super-V display of the OPPO R15 covers 90% of the front surface and consists of a 6.28-inch OLED panel with FullHD+ resolution (2280 x 1080 pixels) in a 19:9 ratio. The side frames have been thinned to an impressive 1.78 mm, but I’m sure no one will notice them because of the other predominant feature on the display: the notch at the top that houses the front camera and various sensors. Of course, I also belong the school of thought that prefers a slightly more pronounced frame and no notch (like on the Galaxy S9 and S9+), but I don’t think the notch is an annoying feature. Call me optimistic, but I see the notch as an extension of the display on the sides of the front camera, not as space stolen from the display for the camera and sensors. 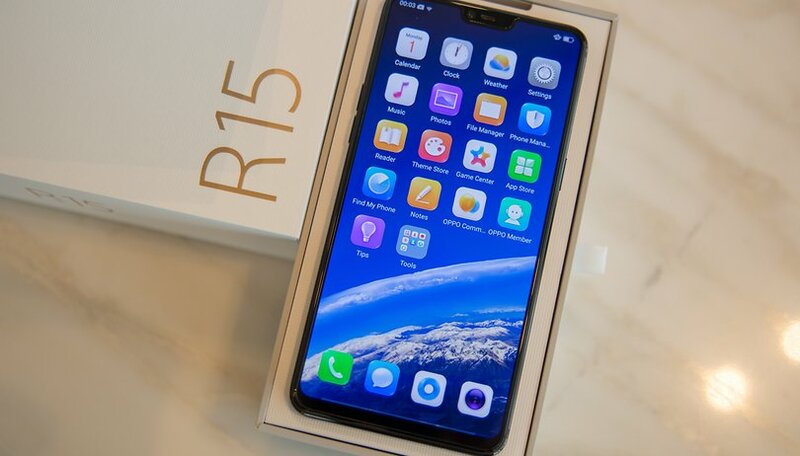 OPPO R15 has arrived to the market with Android 8.1 Oreo, which is a relief since smartphones with SoC Mediatek are usually not famous for having the latest version of an operating system. Not all of them are roses and flowers, however: the software is strongly personalized by the company under the name of ColorOS 5.0, and from what I could tell, it has a very Chinese style. This means no app drawer (like Flyme, MIUI and EMUI) and a strong tendency to invoke the UI of iOS. By default, a gesture navigation system is activated in the style of iPhone X and Xiaomi Mi MIX 2 (which was inspired by Apple and updated accordingly). Fortunately, you can turn this function off and use the classic and well known navigation bar with the Home, Back and Recent buttons. If Mediathek makes you jump through hoops, OPPO has given you some consideration in this case: the Pro variant (Dream Mirror Edition) uses a SoC Qualcomm Snapdragon 660 at 14nm. It’s up to you to choose if you want to use it. The OPPO R15 battery is 3,450 mAh and features fast charging from VOOC via a micro-USB post. OPPO promises that with 5 minutes of charging you’ll get 2 hours’ worth of phone calls, and of course we’ll test this charging technology in our full review. The R15 PRO battery loses 50mAh, but that’s certainly not a substantial difference. We expect the two devices to perform similarly in daily use. The main camera of the OPPO R15 has 16 megapixels. The sensor is a Sony IMX519 with a size of 1/2.6” and 1.22μm pixels. Its lenses have a focal aperture of f/17. The second back camera is 5 megapixels and has an aperture of f/2.2 on the R15 and 20 megapixels and an aperture of f/1.7 on the R15 Pro. There’s no optical stabilization, but there is an electronic stabilization to mitigate shaking when you take photos. The front camera is a 20 megapixel f/2.0 and is supported by artificial intelligence that can recognize 296 points on your face. AI is also used in the main camera: the smartphone can recognize 16 different scenes (and 120 combinations of these scenes) and adjust settings accordingly to make your photos that much better. We will, of course, test out the OPPO R15 cameras in our full review. The OPPO R15 and R15 Pro are available for purchase beginning April 1st in China and other countries where the brand is widespread in the colors Snow White, Hot Red, Star Purple, and Infinity Black. The standard OPPO R15 has a price of 2999 yuan (around 470 dollars), while the Pro version, which is called the Dream Mirror Edition in China, has a price of 3299 yuan (517 dollars). The OPPO R15 Pro in ceramic black has a price of 3299 yuan (549 dollars). We don’t have any news yet about the official availability of the smartphone in the U.S., but it will certainly be possible to buy it through some sites specialized in importing Chinese devices. We do, however, expect the brand to have a wider-spanning official release by the end of 2018. OPPO has certainly shown how even a mid-range smartphone can do a great job. When you reject top-range specifications you usually have to settle for a smartphone that isn’t elegant and poorly manufactured. The R15 goes against this trend with a glass body, special colors, excellent manufacturing and a display that covers most of the front surface with minuscule frames. Its price in China makes it a really attractive purchase, especially the Pro version in ceramic. Of course, we’ll test the smartphone carefully to provide a more in-depth assessment of its performance, software and camera. So stay tuned for our comprehensive review! This device screams 'overpriced knockoff' all over. FYI, Oppo never updates their software so you are stuck with what you buy while other companies such as Xiaomi and Huawei support their midrange for at least 1 year. The only reason Oppo is so well known is because of its pervasive marketing schemes. So, be a conscious consumer and do not let lazy companies like this take advantage of you. Here my friends, you have the OnePlus 6, with the added features that will be left out of the OP6. oppo r15 when go egypt 🇪🇬 ?